If you are using Office365 to run your day-to-day business operations, bringing your contacts and employee information into Zoho Inventory is quick and simple. Invite users to your Zoho Inventory organization from your Office365 account. Import all your contact information into Zoho Inventory from your Office365 account. You must have an account with Office365. The email address with which you log in to your Office 365 account and Zoho Inventory account must be the same. Have a different email address? Login to your Office365 account. Click the apps icon on the top-left corner and click View all my apps. Click the Store icon and type Zoho Inventory in the search box. Click on Zoho Inventory in the search result and click Add. Now, Zoho Inventory will be added to your list of apps. You will now be taken to the Setup Organization page where you can enter your organizational information. Login to Zoho Inventory with your Microsoft credentials. Go to Settings -> Integrations. Under Other Apps, click Office365 account button next to Office365. Click Proceed to go ahead with the integration. 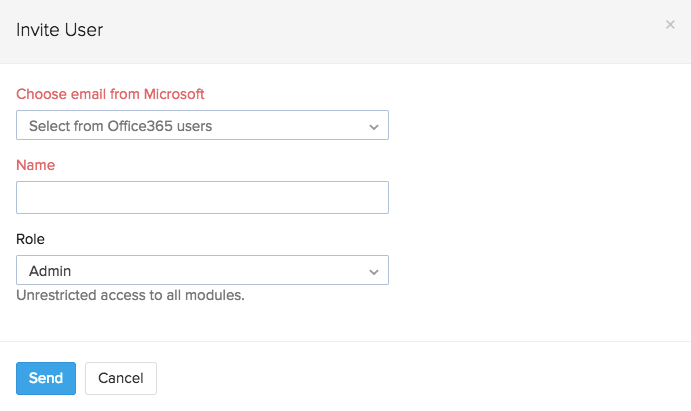 With an active integration, you can directly invite employees of Office365 to access Zoho Inventory. Log into your Zoho Inventory account. Click the Gear icon present on the top-right corner and select Users & Roles. Click the Invite Office365 User button. Select the user you want to invite under the Choose email from Microsoft drop-down. Associate an appropriate role to the user and click Send button. 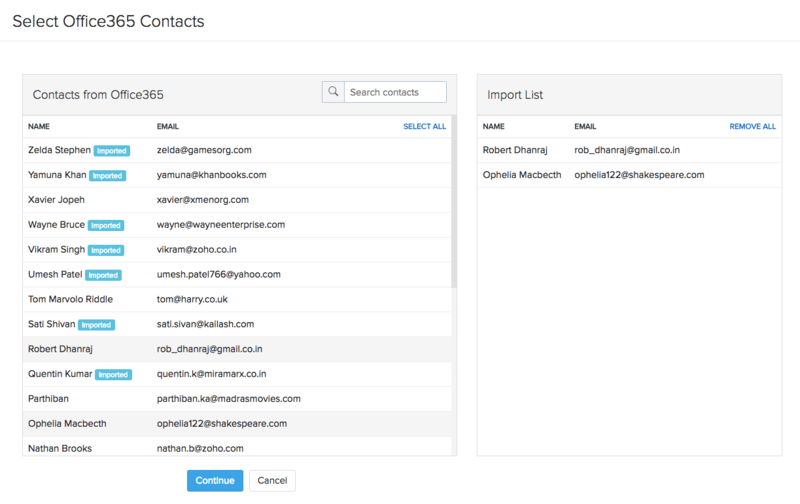 You can import all your contacts from Microsoft People to Zoho Inventory in one sweep. Open the Contacts tab on the left sidebar. 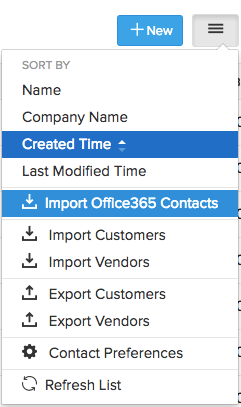 Click the hamburger(or stack) menu on the top-right corner and click Import Office365 Contacts. Select the contacts which you would like to import, and click Continue. 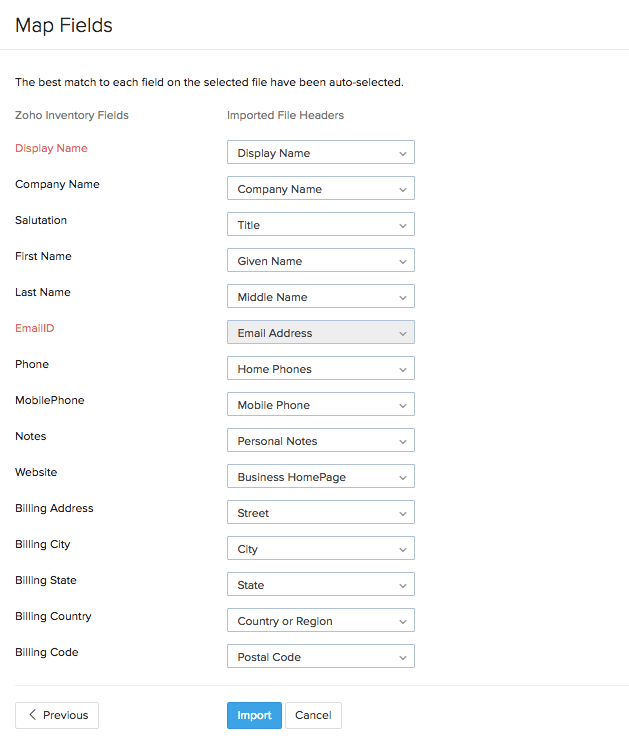 This action will take you to a Map Fields window, where you can connect matching input fields between your Office365 and Zoho Inventory account. This action will import all the selected contacts from your Microsoft account into Zoho Inventory.